Isabelle and Jacq were finally in Gabriel’s care. Samuel had mixed feeling in meeting Isabelle again. Memories of their childhood an then budding love had came flashing back to him. He could not stop his tears as he nears Isabelle. He finally called out her name and she looked at him with the same longing and happiness. They hugged filled with emotions because the moment of being with each other had finally come despite all the sacrifices and hardships. Isabelle told him that she never had any regret in loving him even though it had brought so much pain and challenges. They once more professed their love for each other. Jacq and Gabriel were also finally together. They admired the fireflies just like their parents had been many years ago. Tessa asked Natalia to convince her father to let go of Isabelle and Jacq. Franco acted so devastated and told Natalia that he did everything to give her a whole family. She said that he would prefer just having her dad. Samuel asked Isabelle for forgiveness that he was not able to prevent her from suffering in the hands of Franco. She said that with those painful experience, she learned to be stronger and more courageous. Franco was worried about Natalia’s feelings but Tessa told him that she is beginning to be curious to his real character. He is confident that Natalia would stay loyal to him out of all people. He plans to hunt down Samuel at all cost. Jacq was happy for her mother and Samuel. She is also happy that Gabriel was able to let go of his hatred. Meanwhile, Natalia was heartbroken. She knew that Gabriel used her but she still can’t let her father hurt him because she still loves him. Jacq was able to reunite with her known parents. She told them the real story of their family. Gabriel broke the news that they are now a officially a couple and Isabelle gave her blessings to them. They were happy to celebrate until suddenly a glass hit the floor and broke into shards, a very common bad omen to Filipinos. Samuel promised that he would give Gabriel and Jacq a peaceful life away from Franco. He wanted Gabriel to live on filled with dreams and hope. Would they be able to escape Franco without losing someone? What will Franco do now? Until when will the happiness last for Samuel and Isabelle? 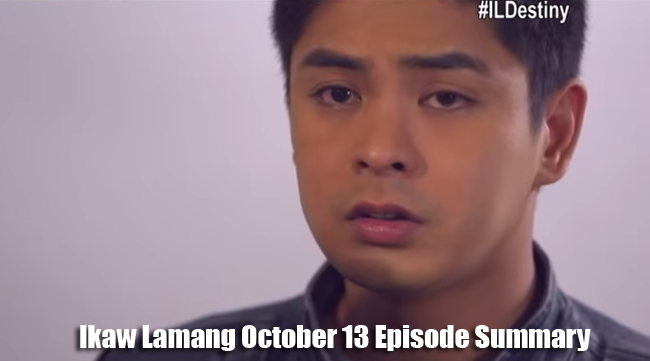 Read all other Episode Summary of Ikaw Lamang here.